alaTest has collected and analyzed 46 reviews of Viewsonic ViewPad 10s. The average rating for this product is 3.4/5, compared to an average rating of 4.3/5 for other products in the same category for all reviews. Reviews about the size and battery are on the whole positive. The price and durability are also appreciated. Some have doubts about the design and reliability, while the screen and usability get mixed opinions. We analyzed user and expert ratings, product age and more factors. Compared to other products in the same category the Viewsonic ViewPad 10s is awarded an overall alaScore™ of 84/100 = Very good quality. alaTest has collected and analyzed 1 user review of Viewsonic ViewPad 10s from Amazon.co.uk. The average user rating for this product is 5.0/5, compared to an average user rating of 4.3/5 for other products in the same category on Amazon.co.uk. alaTest has collected and analyzed 1 user review of Viewsonic ViewPad 10s from Amazon.com. The average user rating for this product is 4.0/5, compared to an average user rating of 4.1/5 for other products in the same category on Amazon.com. Will this Android-toting 10' tablet right the wrongs of its predecessor? There is a ludicrously thin 9.7-inch shadow over tablet releases at the moment. The iPad 2 has landed, and we judged it the best tablet yet. However, that doesn't stop the march of Apple's competitors. A fast and well-built Android tablet, but Advent's Vega is better value. 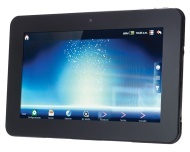 We reviewed ViewSonic's ViewPad 10s, a 10-inch tablet running Android 2.2.